ENCINITAS — Rev. Brenda Sol stood outside of the main office building of her church, St. Andrew’s Episcopal Church, and pointed to a soot-stained wall and charred bush along the church’s main building. “Firefighters said that five minutes later, it would have all been destroyed,” Sol said. Crews were able to save the main building, but the early morning Oct. 22 fire destroyed what is known as the “Friendship House,” an old barn that the church had converted into meeting space for various groups, including a teen group and a local Boy Scouts troop. That fire would turn out to be the first of a string of fires in that neighborhood that investigators believe are the work of a serial arsonist. The latest incident occurred on the same church grounds during the early morning hours of Nov. 12, when fire crews responded to a report of a fire inside the church’s preschool building. Much like the first incident, the fire occurred during the early morning hours, so no people were inside at the time. And in between those incidents, a two-alarm blaze ripped through the front office building of Oak Crest Middle School, just a block north of the church. Investigators with the Sheriff’s Bomb-Arson unit said that the timing and the proximity of the three fires leads them to believe the incidents are related, and are searching for clues to identify and apprehend a suspect. Investigators said, however, there is no evidence that the incidents at the church are a hate crime. Meanwhile, Sol said that the church community is praying for the safety of the community, the church and the suspect. “But we are praying for the neighborhood around us and for the person who is doing this, and we are praying that the suspect is apprehended before they hurt someone, including themselves,” she added. Sol said the fires have required the church to shift a lot of groups around that normally would meet in the friendship house, and preschool has been held in the parish’s main office until smoke damage can be cleaned up. The church was also without its main power source and phone lines, as both were housed in the Friendship House building, but crews quickly restored both systems. The Friendship House will have to be demolished after the fire rendered it irredeemable, and the church will need assistance with that cleanup effort, Sol said. 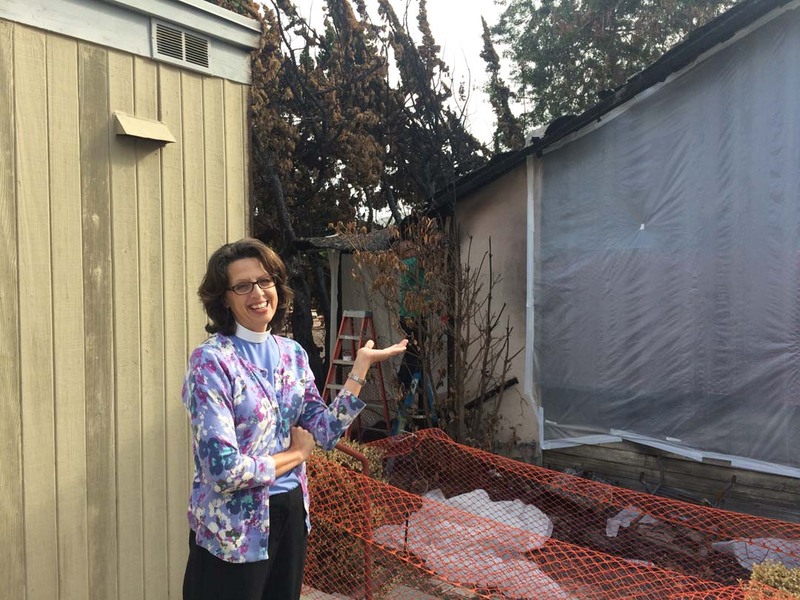 Fortunately, she said, the church’s insurance will cover the structural damage and any contents lost in both fires. Sol said the two fires initially shook her church’s community, including parents who worried about the safety of the children after the second fire in the preschool. But a sense of resolve has emerged from the initial fear. The church continues to host a weekly food pantry and weekly lunch for seniors and the disadvantaged. And the church will continue its other services it renders to the community. And on Monday, two days after the fire, the church celebrated its annual feast in honor of the church’s namesake, St. Andrew, which included a march around the block led by bagpipers.